Hello, I hope you are well. 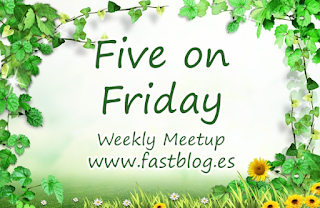 Today I'm joining with Five on Friday to show five things that have been happening here. This week has been a strange one. I've been full of cold all week and haven't felt well at all. I don't know where I'd caught it from. The last 2 that the family had, I managed to avoid. The teens have been off school and college since Wednesday due to closure / no buses, all because of the snow. I'm not sure how Lincolnshire compared to other parts of the country in the UK but, they were happy to be off. My garden, the 2 large trees that the Christmas lights are usually strung around. No washing out today. In the summer, this border is usually full of colour and bushiness. The bird table with a variety of seeds, nuts and fat balls. A feeding table which provides some entertainment for the lovely QT. He 'chatters' away to them when he's safely inside out of harm's way. He's only caught 1 bird in the 3 years we've had him, though he's never out for long. Talking of QT, he went to the vets yesterday having routine thyroid blood tests. Good news, he's gained much needed weight and his blood pressure is down. The meds are working. He was cuddled and praised for being so calm and quiet during the test. I don't think I'd like a needle in my neck vein on a regular basis but then who would. His next check should be in 6 months time, so stabilising. My bulbs are happily growing in strength. Though it's bright, it's not particularly sunny so the dancing sunshine (plastic plants) 'don't feel like dancing'. The teens had one each, many years ago. The one wearing shades was in teen 1 bedroom but the swaying side to side in the morning sun, 'disturbed' his sleep. Oh dear! They sit on a windowsill downstairs now. Last weekend we made up some more mincemeat. I know it's not Christmas but we'd run out. I can't eat sorbitol containing fruit (fruit with a stone) including apples and cherries, so it's easier to make our own. Whenever I make a pie, it's handy to make up a few mince pies with any leftover pastry. M has made 2 lots of bread this week in the Kenwood mixer. 1 loaf and 6 rolls at a time ready to prove in front of the fire. We've given up on breadmakers, they keep breaking, so we bought a mixer and prove the bread then bake it ourselves. To make - put all the ingredients in the mixer, mixing for 1 minute on low and 3 minutes on number 2. Place the folded dough in well greased tins, or divide into rolls on a lined baking tray. Leave to prove until doubled in size and bake the rolls for 15 mins and the loaf for 30 mins at about 190* / Gas 5. I think the book is out of print so I've included the recipe with the baking times & temperature, that we find works well. If using the fast acting yeast, only one rising is needed. M has been off work a fair bit too, as a driver instructor it's a brave person that'll take a new learner out of the icy roads. On Monday alone, the test examiners were cancelling tests and that was before the weather turned really heavy with snow. The beer bread was put out ready to make, a Christmas present which is still waiting to be made. I've been listening to some Erica Jacobs digital library books whilst crocheting sneezing. If you'd like to make your own, here is the flower pattern and here is the square pattern. I used Wendy 100% cotton red, Stylecraft 100% cotton white and a 3mm crochet hook. I also finished my first crochet block for 'Weekend Stitches' on my blog, including blocking it, a process I've never done before but am impressed by. Before I blocked the square, the corners were curling up and the 3 middle sections were tight and narrower than the rest. Had a snow day? Got things ready to do and promptly 'not done' them? 'Crafted' anything? Please leave a comment, have a good week. I hope you're feeling better now. I've managed to avoid all the bugs so far this winter, though I hope I haven't jinxed myself by saying that now. We've had quite a bit of snow here, the local schools have been closed, I'm glad that Mick's able to work from home. I think we've seen the worst of it though now. I'm glad to hear that all's well with QT, our furry friends are such a worry at times. It's a while since I've made my own bread, I seem to go in phases baking my own and then going back to shop bought. I've got a breadmaker but I only use it for making the dough, I always bake the bread in the oven as it turns out much nicer. It's amazing what a difference blocking makes. So sorry you felt poorly. SO many people have been so ill this year. Love our crochet, it is just so relaxing isn't it? Stay safe in all the snow. Hope you are feeling better. Thankfully no snow here but the temperatures have dropped so it is cold. I am working on a quilt and always have a crochet project on the go. Thank you Mamas Mercantile, yes feeling much better now. The snow is nearly all gone now. Teen 2 had a text from school saying 'back to school' tomorrow. He's not keen but... he did have an extra 3 days off school last week. Hope you are feeling better. We had a run of much enjoyed snow days and now we're getting the calendar news, day sliced off of spring break this month and the school year extended 'til the 25th of May. Such a cute cat, glad for the good report! Making bread is very satisfying I think. We have a Kenwood, too. It takes the hard work out of bread making but is still fun. What a good idea to make little mince pies with leftover pastry! We make jam tarts, which is not quite so yummy.